Liked this video? Check our the rest of our Build in 5 Minutes videos. 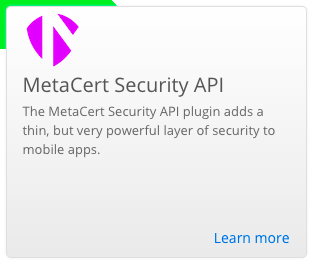 To make it even simpler to use the MetaCert Security API, we have published a MetaCert plug-in. Appery.io developers can quickly add the plug-in to any new or existing app and check for the reputation of any web links in the app. View more videos on Appery.io Youtube channel. Darryl Taft from eWeek published a great article: No-Code Platforms, Cloud Services Offer Options for Mobile App Dev. The article talks about pressure enterprises face today to deliver mobile apps fast. The article also covers Appery.io. An excerpt is below and full article here. Mobile app development environment provider Exadel’s Appery.io offers a cloud-based rapid development environment with integrated back-end services and a catalog of API plug-ins that simplify integration with cloud services and enterprise systems. As part of its solution, Appery.io also features a no-code, RAD environment. Kattan said Exadel expects that 25 percent of all apps that will be developed for the enterprise by 2015 will be built using codeless tools. He also cited a Gartner report that predicts that by 2018 more than half of all apps will be built with codeless tools. “We have a graphical development environment, but we don’t limit you to the GUI,” he said. Appery.io recently announced it has reached more than 150,000 developers that are using the platform. Exadel’s Kattan says Appery.io offers a complete mobile app development platform—not just tools but complete backend services in the form of an MBaaS. I will be at Bay Area Enterprise Mobile App Development meetup on October 23, 2014 showing how to build great apps with Appery.io. Hope you can be there.